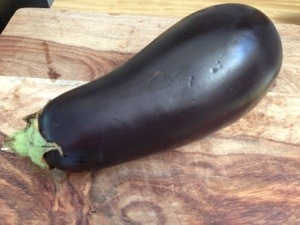 I was somewhat complaining earlier today because all I had in my fridge for dinner was an eggplant and I didn’t feel like going to the store. I ended my night however with a meal that Kyle said was in my top 5 of all time. (Woo hoo!) 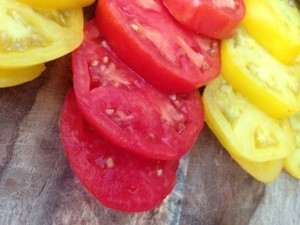 I was able to pick some tomatoes right out of my aunt’s neighbor’s garden and somehow I came up with a healthy, heavenly, fresh summer dinner. 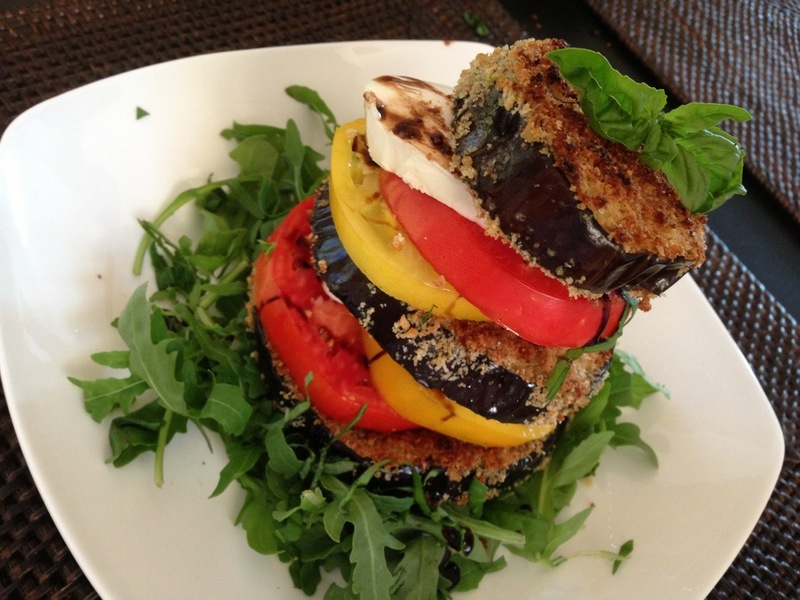 Cut your eggplant into thick slices. 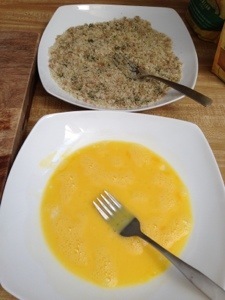 Whisk the egg in a shallow bowl and season with salt and pepper. 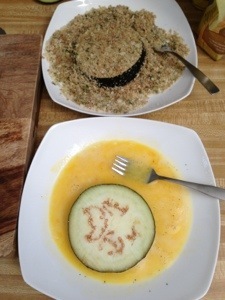 Add your breadcrumb mixture to another shallow bowl. 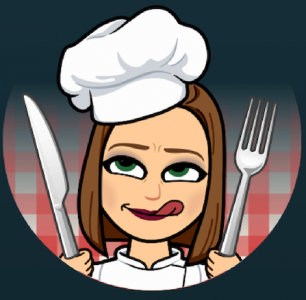 Add fresh chopped garlic and parsley if you have it on hand- if you are using seasoned italian breadcrumbs it’s not necessary. I also added some salt and pepper. Then add oil to the breadcrumb mixture to wet it a bit. 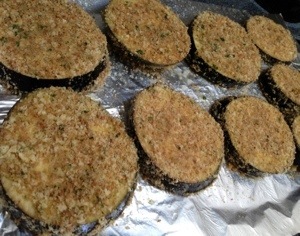 Since we aren’t frying the eggplant, wetting the breadcrumbs will help them crisp up in the oven. 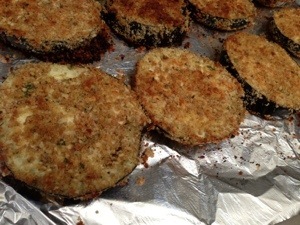 Place each slice of eggplant in the egg mixture and then into the breadcrumbs. Coat it well. Then place on a baking sheet lined with tin foil and sprayed with oil so they don’t stick. After about 15 minutes turn the oven to broil so the breadcrumbs start to brown. 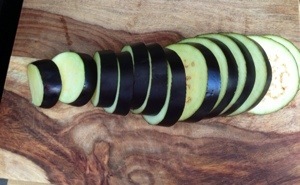 Then turn the eggplant over and do the same to the other side. Spray with more oil if necessary. 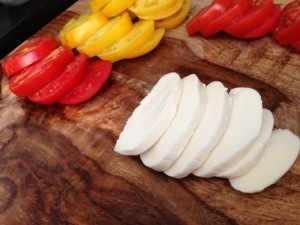 Slice your tomatoes and mozzarella into thick slices. 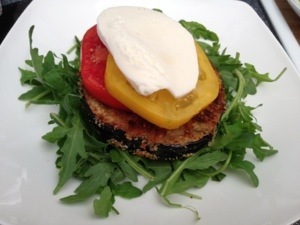 I placed some fresh arugula on the plate (an optional step). 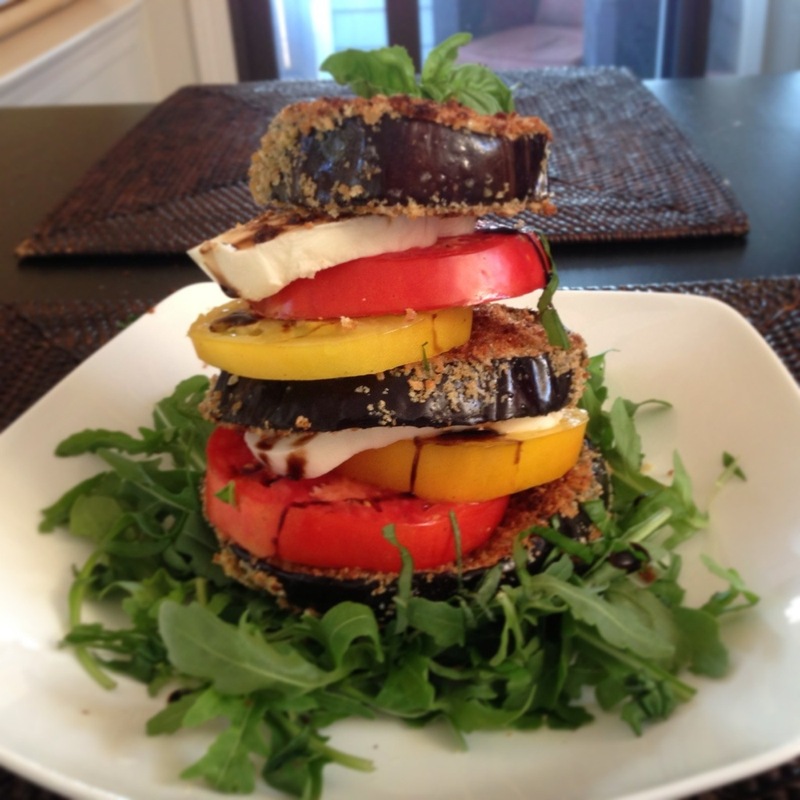 Then layer the eggplant, tomato, mozzarella and drizzle some balsamic glaze. Repeat steps until the stack can’t grow anymore. Dig in with a knife and fork. It may get messy but don’t let that stop you.